Spokane Arena's management is always working hard to bring top notch entertainment to our area. And while some big names have come the Arena's way lately, there is more to the Arena then just the entertainment value. Not long ago, the Arena added a Spokane Chiefs Team Store on the bottom level and is apparently continuing their work in upgrading the dining / drinking options around the Arena's oval shaped corridor. This with the official news of a new taproom style bar now under construction on the South side of the Arena. This new business will be called Boone St. Taproom and will be small, serving no food. But it will bring something new to the events at the Arena, craft beer! They won't say exactly how many beers will be offered at the new Boone St. Taproom but anything is improvement over the many Bud Light only stands currently dotting the Arena. 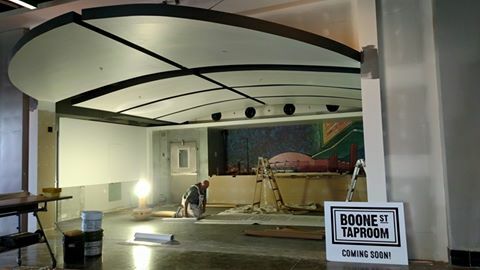 The Boone St. Taproom will be open during most events, except those that don't allow alcohol sales ( i.e. Disney on Ice ) . Because the business is located inside Spokane Arena it will not be open to the public, but only to those with event tickets. Boone St. Taproom joins Red Tail at The Arena, Absolut Grill and The Limerick Pub as dining / drinking choices inside Spokane Arena. There is also a number of small concessions around the Arena corridor which will likely be very slowly phased down in the coming years. And, for those not want to pay to eat / drink inside the Arena ( which isn't as expensive as one might think) . The Blackbird Pub will be open for business very soon in the historic building at the corner of Cataldo and N. Washington, only a couple of blocks from the building.